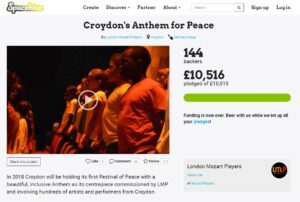 Anthem For Peace: Crowdfunder target achieved! You are here: Home / Blog / News / Anthem for Peace / Anthem For Peace: Crowdfunder target achieved! We are delighted to announce we have reached 100% of our crowdfunding target! Thank you so much to everyone who has given so generously (some multiple times). We’re so moved by the response to this project, and really excited to now move forward and make it all happen. If you haven’t already heard, we’ve announced the Anthem’s lyricist as Selina Nwulu! You can find out more about her here, but check out this wonderful piece too!